Yep! Great to be back online Dawoodman! I'm just setting up a thread for the upcoming event, should be ready soon! Boy the event looks insane... so looking forward to it!! This week's frontal systems look like doozies, especially the one later this week. Very strong winds and snow down to low levels look like being on the cards. 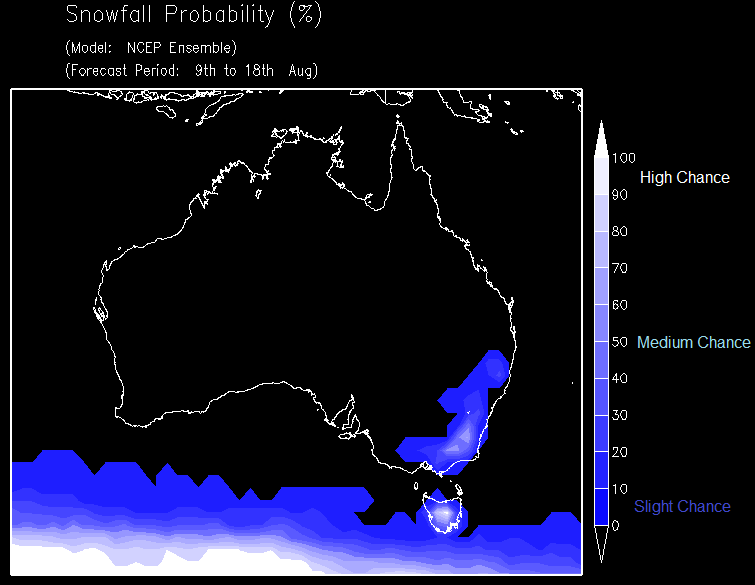 Some longer range modelling's been hinting at another cold SW'ly outbreak with an outside chance of snow down to low levels over southern SE Australia around a week from now. EC currently has sub -4C temps at 850hpa coming up. Still early days though so this is subject to change. Well Ken, you must feel pretty chuffed with the success of your scripts (I am!). In regards to the weather in a weeks time, per your posts above, I can see what I think is an unusual situation. A high pressure system forming in the bight (summer stuff) that "traps" (rather than "nudges up") a pool of cold "blue line" upper air to the NNE of it, cutting it off over SE Aus. One to watch for sure!!!! But fingers crossed the potential events in store over the next 7-10 days or so, the more rain we get the better! And hopefully an increased chance for low-level snow!! Thanks Petros Yes I was happy, but moreso because I was in Melbourne at the time and I wanted it to come off while I was there. ...not a "biggie" but any takers to start a thread on this? We can expect the start of the typical strong early spring NW'lies after this weeks sunny break?? Yep looks like the fine spell that's moving in for the last week of winter will give way to our first active springtime cold front. Hope we get good rains and storms this coming spring and summer! 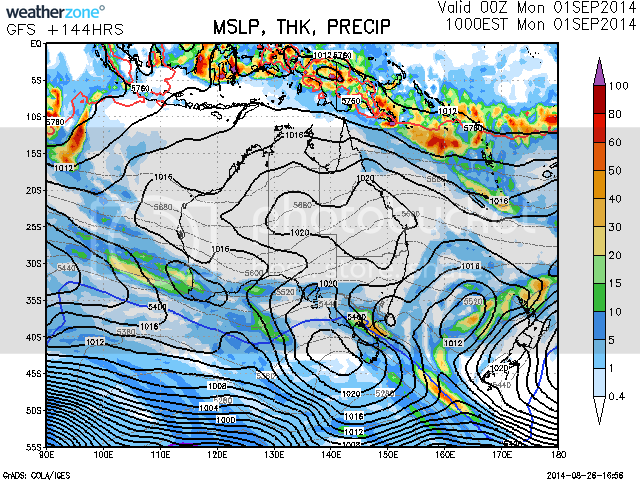 ... so now we have that system slumping to SE Tas allowing a cut-off low to potentially form for next Mon SE NSW instead. ... and we have both AccG and GFS mooting the following LWT to create a 2nd cut-off, leaving Vic with lows W and E of Vic by next Tuesday!! Not an Armageddon event weatherwise, but bloody unusual in my book. ...another anything may happen/watch this space scenario into early next week. If you have a comment - pls start a thread!! 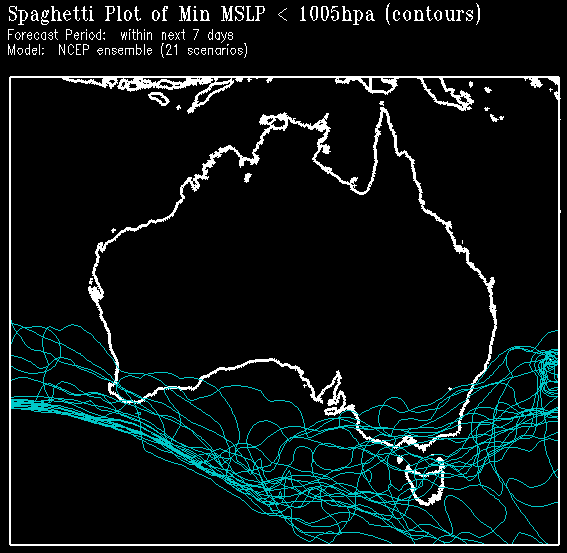 Spaghetti plot of min MSLP over the next 7 days! VERY interesting script Ken - my favourite so far! 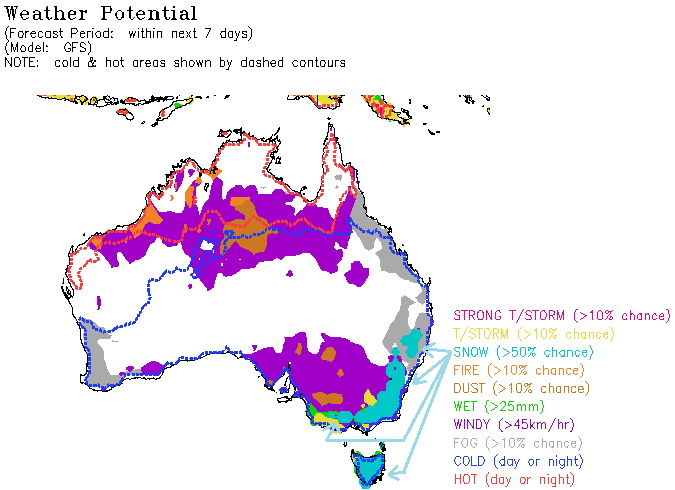 What better ingredients could you put into the soup for a SE Aus rain/late-snow event? (cold air, very very cold air at 120Edeg to feed up, cut-off low potentially to shear near Pt Lincon SA, blocking low sitting E of E-NZ, ...and the time of the year). Something that might be, or might have been, to watch with keen interest eh? Good on ya for pointing that out Petros! Hope it comes off as predicted! Looks like we've got a whole series of cold fronts moving into position in time for the start of spring here in Victoria! Hope things really get into high gear as the spring equinox draws closer and then the annual pre-monsoon build-up starts up north, allowing hot air and potential tropical humidity to be added into the equation, and leading to increasing blustery, stormy weather! 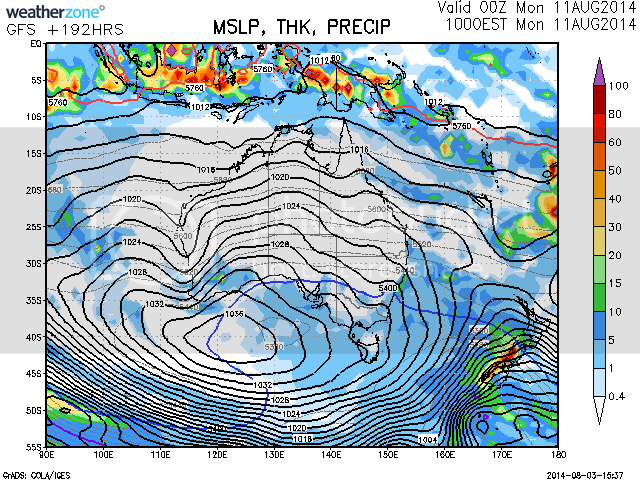 This coming weekend looks mighty fine; that potential frontal system/trough I spoke of a few days ago is weakening and not going to do much other than perhaps set off the odd shower (maybe a storm) over Western Victoria before heading northeast into NSW and Queensland. Otherwise the dominating factor is a large high pressure system, bringing chilly mornings but pleasant afternoons! 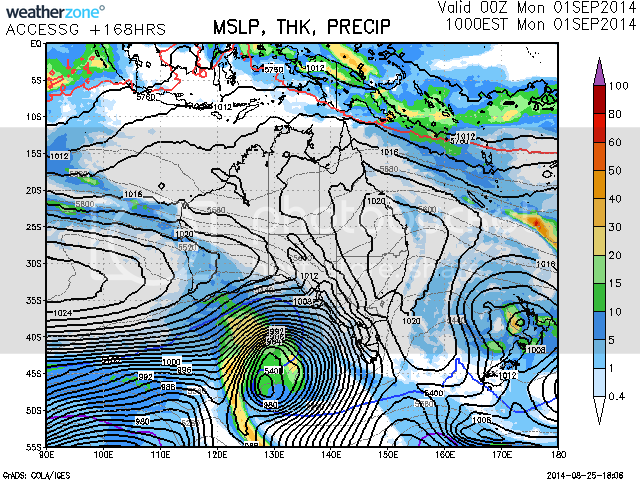 Next week (September 7th-13th 2014) is still a go-ahead, not too sure what ACCESS is showing now, but the synoptic charts still reveal a major storm system that's on a collision course with Victoria! 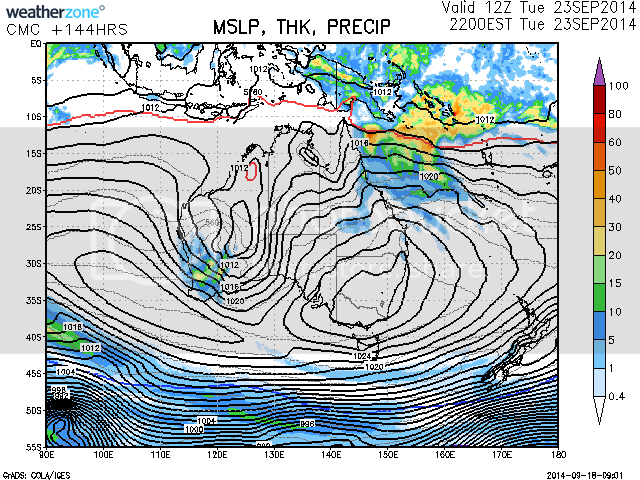 A warm northerly airflow will build up from Monday onwards (sending maximum temperatures up towards 25°C around Mildura), ahead of a deep low pressure system with a series of intense cold fronts and an associated trough. I expect conditions will be quite blustery commencing Monday! Showers and possible thunderstorms from Tuesday onwards, and the possibility of good rainfall totals, mainly along the Great Dividing Range and up in Northeast Victoria, which may see falls of 50-100mm at this stage! 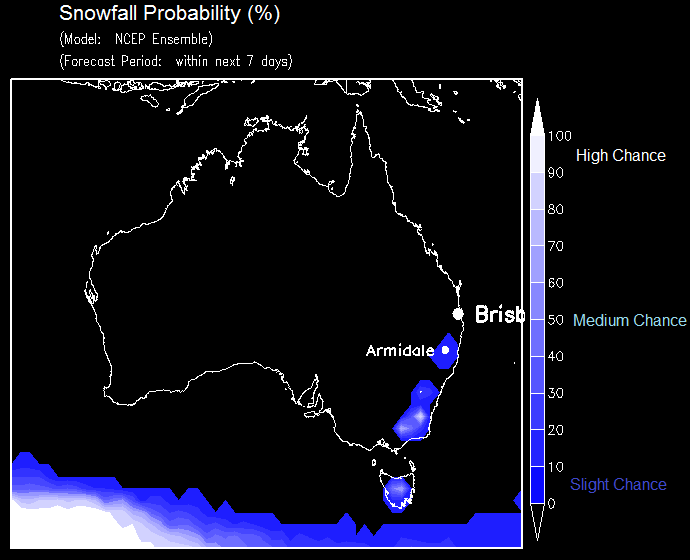 I expect a decent cold outbreak from about mid-week onwards, with more alpine snow! One to watch guys! looking like a front is on the cards for next thursday, still ages out, especially for GFS. the city may miss out on the exciting due to timing, this could fix itself though. Yes I see it too Dawoodman! 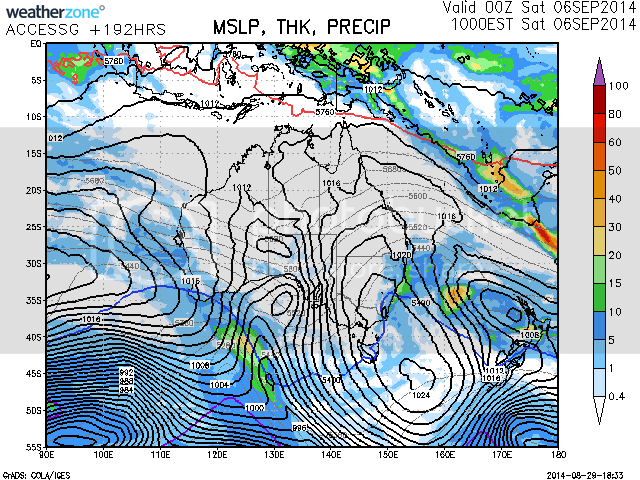 Still too early to know with 100% certain but in coming days the picture should start to reveal itself more, especially on ACCESS, but the Weatherzone synoptic charts are looking promising at this stage! 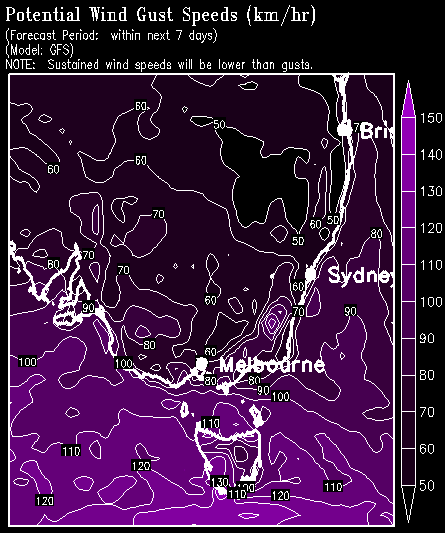 The heat that's forecast to build across Western Australia will get pushed east ahead of the anticipated storm; Victoria's first 30°C+ days for the season may happen around this time next week up in the Mallee region (around Mildura) as winds swing northerly, with 25°C likely for Melbourne next Wednesday (should be great for anyone heading to the 2014 Royal Melbourne Show)! It'll be interesting to see whether or not cold air can get drawn into the low from the south or whether it'll be a cut-off/tropical dip-style system. Hope it brings more good rain and more good thunderstorms! 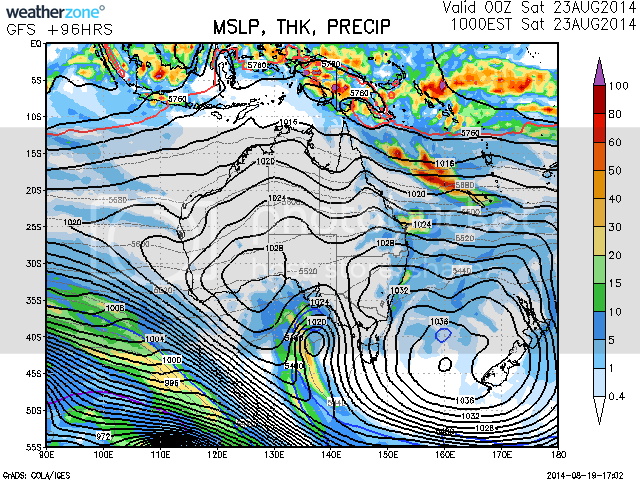 ..... will the low pressure system get too "ripe" and die on Vic's doorstep? ?